Today I have been thinking about a relationship I have wherein I feel I have been betrayed. I approached the Tarot struggling with the idea that there are some things that go on in this world that I do not want to face- there are some behaviors so reprehensible to me that I find there are people I do not want to love. I asked the Tarot, how can I open my heart to all Being? I drew the King of Vessels (Cups) from the Wildwood Tarot. 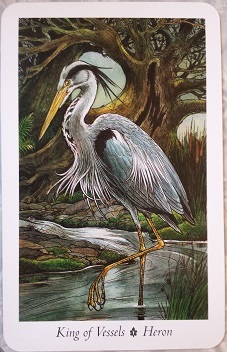 It depicts a heron standing in a swampy stream just before daybreak. He has a very stern look on his face and looks regal and resolute standing in this dark water. The tree behind him looks spooky, and he is alone. What came to mind for me is that my path in this life is to walk through every experience, pleasant or unpleasant as it may be to my mind, and be able to welcome everything into my heart. As the heron bravely stands in the flow of water, representing the unconscious, the unknown, and all emotion, he views this water as his opportunity for food. If there is anything in life that I am shutting out from my heart, I am missing opportunities. To shut out some painful emotion or unpleasantness, I have to close my heart a little bit. This closing is itself painful. As Gangaji says, “What we seem to fear the most is the broken heart. Yet the very unwillingness for the heart to be broken is the broken heart… in order to avoid the broken heart, people live in a state of broken-heartedness.” As the Fool in the Tarot, we must take the leap through every experience and really experience everything- let everything in so that the heart expands and we are able to be in love, which is the Truth of our being, no matter what emotions arise or what the mind finds unacceptable. This entry was posted on Tuesday, March 25th, 2014 at 5:18 pm	and is filed under Uncategorized. You can follow any responses to this entry through the RSS 2.0 feed. Responses are currently closed, but you can trackback from your own site.